Ampersand is a two-way street though, a place for print-based, art-school-educated graphic and type designers to discover the special requirements of designing for the web, and for websters to learn about type, how to use it, and what the type foundries are doing to meet their needs. Ampersand delivered on all fronts. If at times it felt like Type 101 or Web 101 – depending on which camp you were in – a bit of back to basics never hurt anyone. And, as Baines pointed out, ‘designers need to talk to one another’, so it follows that both camps should propagate a mutual understanding of parlance. 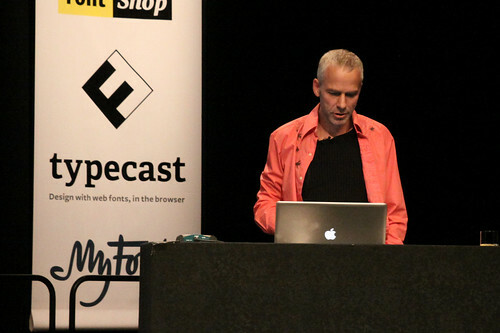 You would never have guessed that Baines, who told us that in 2011 he was an ‘outsider [who] wanted to learn, and did’, was a stand-in, at a few days’ notice, for big draw Erik Spiekermann. His ‘where are we now?’ reflections set the tone. 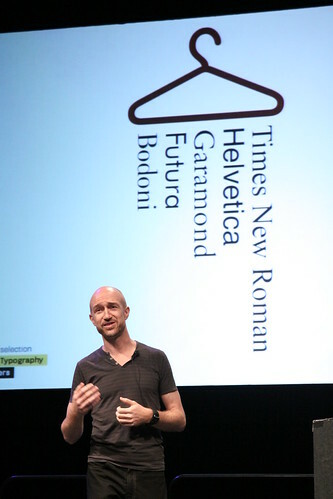 Using his book Type and Typography (co-written with Andrew Haslam) as evidence, he suggested that web delivery was now synonymous with design and communication. In the 2002 edition, the web was dealt with in a one-column sidebar, ‘because it didn’t work the same way as graphic design so we didn’t know how to write about it’. Now, in the latest edition, it’s ‘embedded’. Baines suggested that this moment parallels the situation, circa 1992, when graphic and type designers first achieved required results using digital technology – in other words, controlled the final output. Now that web designers are afforded all the typographic niceties that print designers take for granted, they too need to ‘use general type principles regardless of what work [they] are doing’, while remembering that ‘type is not typography’. He lampooned Google’s promise of ‘three quick steps to a good-looking website’ as wrong thinking, and cited the Government Digital Service’s Design Principles as good practice. Yves Peters, who declared a fascination with type selection, advised keeping four criteria – form, historical context, cultural reference and function – in mind when you buy a typeface (‘If you disregard this, you’re in trouble’). Question what you want to do and why, he said; the tools are all there, thanks to OpenType. His statistics spoke volumes: whereas a decade ago a typeface contained 256 glyphs, now it can have up to 65,536 (that’s 256 squared). To this listener, it sounded as if Peters was expounding the virtues of the tried and tested typography principles, and the now almost lost knowledge of the sub-editor. His message: attend to the details. Double-act Veronike Burian and José Scaglione, of the indie foundry TypeTogether, offered advice on matching typefaces, and recommended Robert Bringhurst’s The Elements of Typographic Style. Their ‘good’ and ‘bad’ examples illustrated a checklist for ordering hierarchy, creating various voices, and enlivening communications. A Jon Tan quote – ‘Fonts are wayfinding apps for emotions’ – hit the point home. Most of their bad examples were pulled from the super-pressurised world of newspaper design, they said, evidencing the lack of refinement, movement and interactivity in the web versions of most publications. As a ‘help strategy’, they urged web (and print) designers to contact foundries for advice and to explain what they need. Again, collaboration was stressed. 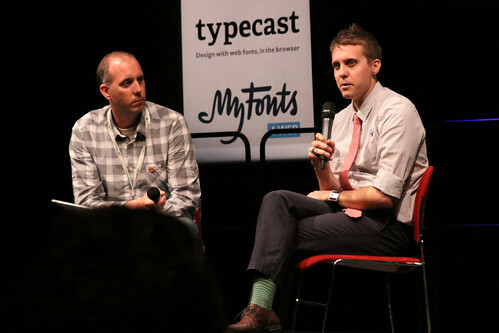 After lunch, three shorter show-and-tell presentations introduced in turn Douglas Wilson, director of Linotype: The Film, made thanks to the KickStarter funding platform with an equipment budget of $20,000 and Canon’s EOS 7D and 5D digital SLRs; Jason Smith of Fontsmith, designer of bespoke brand-building typefaces for TV (you’ve seen Channel 4’s): and consultant Laurence Penney, who put lines of code on screen but so clearly explained CSS fallback fonts, and how to get the exact glyphs you need, that his parting shot, ‘Go forth and subset’, raised a favourable murmur. Luc(as) de Groot promised to talk about ‘the most boring subject in type design’ – hinting – but enlivened his explication with entertaining bon mots about studio life, Berlin, family and friends. 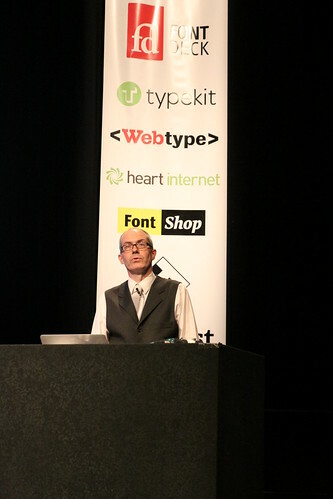 What a pity, he said, that Spiekermann didn’t make it – he wanted to chat about how typefaces look great on a Mac but ‘jumpy and spotty’ on a PC. 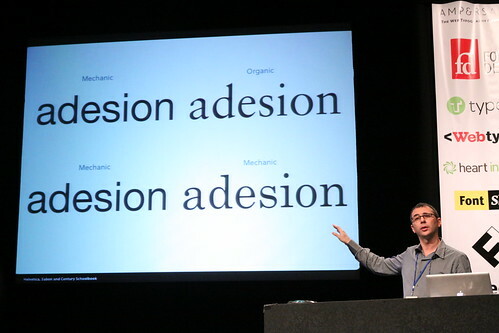 His argument was that typefaces should be optimised to perform on every operating system and browser. And how? By testing, checking and hinting: adding and subtracting, pixel by pixel, to achieve a smooth, solid and legible letterform at every point size, in order to counteract the aliasing caused by screen resolution. De Groot likes to do things properly, and has a studio of ‘hinting slaves and trolls’ to help him. And the web designers thank him for it: he speaks their language, understands their issues, and provides functioning type solutions. Next up, Jake Archibald, a web developer who makes it his business to understand how type works online, in order to optimise website performance, reduce loading time and figure out how each browser deals with typefaces. He gave us the ‘non-designer’s’ view: ‘When a good font is used, it’s subliminal; when it’s bad, you notice it.’ His infographics (remember he’s not a designer) were shockingly entertaining. Again, his advice was: test, test and test some more, and ‘avoid unnecessary downloads’. While Baines cited John L. Walters’ comment that last year’s conference represented web typography’s coming of age (made on this very blog), perhaps this Ampersand was less about celebrating achievements than about practical ways forward. Increasingly, websites are made by web designers not graphic designers, who have gone through an education without coding because their tutors didn’t teach it. If some web designers lack knowledge of type principles (that goes for some graphic designers too…), they’re figuring it out – hence this conference. It also behoves the foundries to meet them half way, and design typefaces with their needs in mind. Thanks to some pioneering geeks, in both camps, that’s already happening. 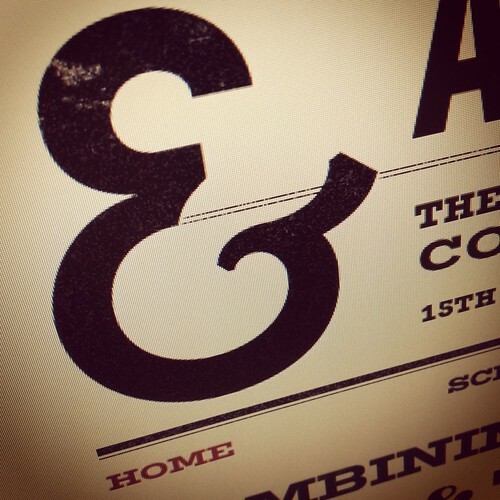 Above: the Ampersand 2012 website. Image by Paul Robert Lloyd. 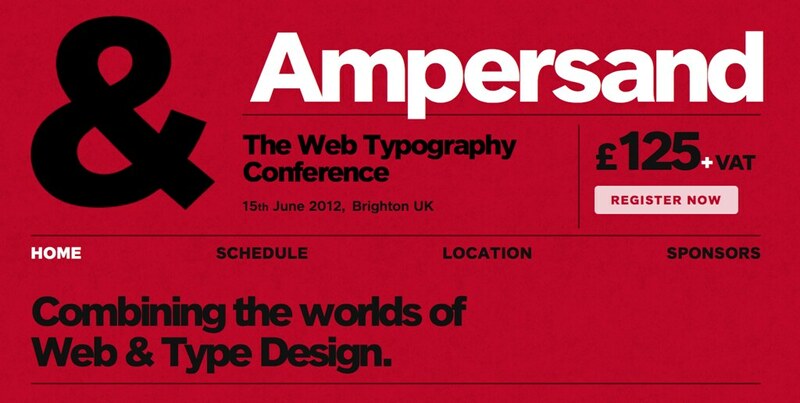 Ampersand: The Web Typography Conference, 15 June 2012, Brighton. Organised by Clearleft and compèred by its production director, Richard Rutter.